Our spring raffle fundraiser is underway! Tickets are $5 each or 5 tickets for $20.00! Tickets are available at: Ally Outdoors, Midland County Sheriff's Office -Public Safety Office and at the Central Fire Department! 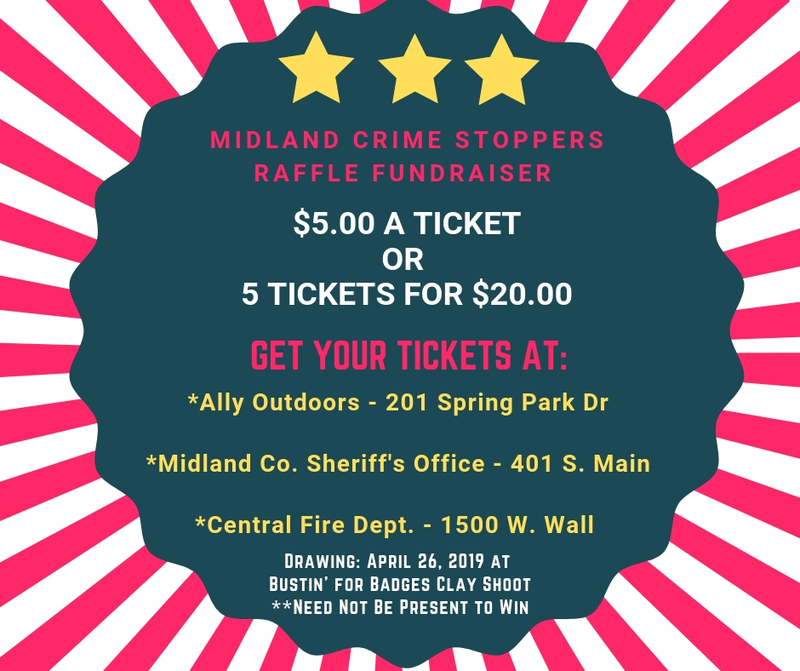 Midland Crime Stoppers is a 501 c3 nonprofit and funds raised will assist with the operational needs of the program which assist local law enforcement in getting criminal offenders off our streets. Together We CAN Make a Difference!! We operate off of donations, probation fees, grants and fundraising. We DO NOT depend on your local tax dollars. All donations are tax-deductible.